Our pest control professionals will conduct a thorough visual inspection of the readily accessible areas of your home or business. This includes crawlspaces, attics and garages. These types of inspections are often called W.D.I. (Wood Destroying Insect) or W.D.O. (Wood Destroying Organism) inspections. Our technicians will look to for wood destroying insect damage from termites, powderpost beetles, Asian longhorned beetles, black carpenter ants and carpenter bees. PLEASE NOTE: WE DO NOT OFFER TREATMENTS FOR TERMITES, POWDERPOST BEETLES, ASIAN LONGHORNED BEETLES OR REMEDIATION SERVICES FOR WOOD-DECAY FUNGI. Termites found in the United States are grouped in three categories: dampwood, drywood and subterranean. Termite issues in Michigan are largely caused by subterranean termites. 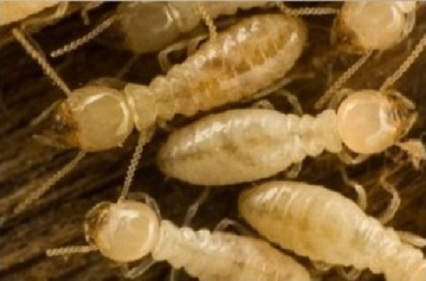 These termites are found in every state except Alaska. Subterranean termites nest in the soil where they get most of their moisture and feed on wood (and potentially any cellulose-based material) that comes in contact with the soil. Termites prefer to feed on soft, spring growth wood and do not typically prefer to feed on hardwoods or chemically protected wood. Subterranean termites must protect themselves from temperature extremes and from attacks by ants and other insects. Worker subterranean termites will build shelter tubes or “mud tubes” which lead from the ground to their food source. The presence of these tubes along your foundation is a sign of a termite infestation. These tubes can be several feet long and can even be built freestanding by the worker termite. Another sign of an infestation aside from swarming termites, are discarded wings which can pile up inside the home in small piles. These wings can look like fish scales in appearance. Sometimes termites are confused with swarming ants. TERMITES: Straight antennae, broad waist, all wings same length. SWARMING ANTS: Elbowed antennae, pinched waist, wings different length. A term used to describe specific wood-boring species. The name comes from the ability of the larvae, over a period of time, to reduce wood to a mass of fine powder. The larvae attack deciduous trees. The larvae are white, C-shaped and spend months or years inside wood while developing. These beetles are only apparent when they emerge as adults, leaving behind pinhole-sized openings, often called “shot holes”. The adults do very little actual damage to wood and serve primarily a reproductive function. NOTE: Asian longhorned beetles have not been found in Michigan trees. However, due to the damage they cause and reports of activity in trees in Ohio, they are considered a potential threat to trees here in Michigan. Asian Longhorned Beetles have long, thin antennae which are as long or longer than their body. The beetles have a shiny black body and have white spots on them. Their antennae are black and white banded. They are 3/4 of an inch to 1 1/2 inches long. They attack healthy trees (especially maple trees) and chew right through the bark. These ants are 1/8 inch to 1/2 inch long. They do not eat wood but make cavities in rotted or damp wood (typically, however they can nest in solid, dry wood if expanding their nest). Sometimes they leave piles of wood shavings (called frass) which indicates an entry-point. They will nest in various timbers used around the home and in hollow trees and logs. Carpenter ants are commonly found in kitchens (especially around dishwashers), in bathrooms and in other areas of the home where water damaged or rotted wood is present. Carpenter ants are commonly found in kitchens (especially around dishwashers), in bathrooms and in other areas of the home where water damaged or rotted wood is present. Carpenter bees look like bumble bees, are mostly hairless and do not have the yellow markings on their abdomen like a bumble bee. The males are territorial and aggressive and if people near by move quickly, they will even fly within a short distance of them. However, they are harmless since they lack a stinger. The females can sting but usually don’t unless they are strongly provoked or handled. Carpenter bees make holes that are about 1/2″ in diameter to nest, take shelter and winterize when the weather gets cold. The holes are nearly perfectly round (customers usually say the holes look like they were made with a drill). They commonly make a short entry hole (about 1″ deep) and will will make long tunnels at right angles from the entry hole. They nest at the end of these tunnels. They usually nest in wood beams, trim, posts, shingles and play structures. Carpenter bees make holes that are almost perfectly round. Often the holes look like they were made with a drill. Our inspectors will conduct a thorough inspection for evidence of wood destroying pests throughout the visible and accessible areas in and around your home or business. We do not offer treatments for termites, powderpost beetles, Asian longhorned beetles or remediation services for wood-decay fungi at this time, however all of our inspectors carry a state-issued ‘Category 7B’ certification. The results of the inspection will be submitted on Form NPMA-33. This form is approved by HUD for FHA and VA Loans.